Your expedition to the Amazon River offers a rare opportunity to see a totally different world, very detached from urban development where you will discover an astounding sphere of sheer nature and an effervescent biodiversity of flora and fauna. To help you experience an astounding Amazon Adventure and make your enchanting rain-forest foray worth its while, we have prepared this suggested itinerary for a short stay. You will be met and welcomed by our staff at the Luggage Claim area of the Iquitos Int’l Airport where our staff will assist you and transfer to our Office in Iquitos town proper. A briefing about our services, what to expect during your stay, the do’s and don’ts in the jungle and some essential tips will be carried out shortly. Soon after, you will transfer to the Iquitos Port, where you will board one of our speedboats to take you to the Heliconia Amazon River Lodge along the Amazon River.During the boat ride observe the convergence of the brown turbid waters of the Amazon River with the dark waters of the Nanay River. Enjoy the impressive jungle landscapes with the rustic small houses of the riverside towns. Then have a short stopover in Monkey Island, a family social enterprise focused on conserving and protecting endangered monkey species in the Northern Amazon. 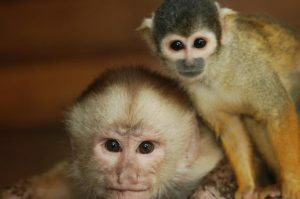 The goal is to enlighten rainforest guests on the effort to reintegrate monkeys and their survival in the wild. See the monkeys free in this reserve, not in cages, their temporary stay here depends on their capability to adapt back to its jungle habitat. After a 60 minute boat ride arrive at the Lodge where our staff will welcome you with an exotic jungle drink. 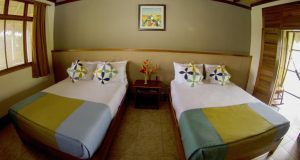 Next check-in and settling in your room, at your leisure, taste your first Amazonia cuisine lunch. 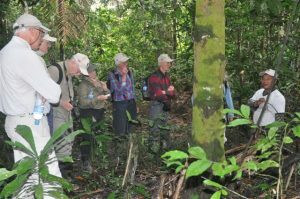 In the afternoon, begin your first excursion: set out to a jungle hike into the Yanamono primary rainforest reserve, for approximately two hours accompanied by our expert guides. 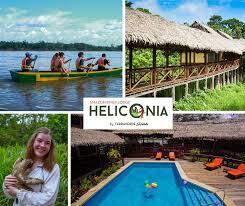 They will show you identify several flora species such as heliconia flowers, medicinal plants and giant trees. You will also have the chance to sight several birds species such as the Turkey Vulture (Cathartes Aura),Black Fronted Nanbird (Monasa-Atia), and with a little luck you will be able to view a family of small monkeys such as marmosets (Saguinus Fusicollis), the Titi (Callicebus Mollock Mollock) and the squirrel monkey (Saimiri Boliviense). Return to the lodge for rest and relaxation and be enthralled by your first, must-not-miss Amazon Sunset. Rise early for the Morning Bird Watching. In order to see the birds flocked together during their morning feeding time, you will start very early going by boat to one of the several streams (best on high tide) to look out for a number of variety of birds.You will be looking out for birds such as the Tuki(Jacana Jacana), Ringed Kingfisher (Ceryle-Torquata), Black-Collared Hawk (Busarellus nigricollis),among others. Thereafter, you will return to the lodge, for a scrumptious and energizing breakfast. Take a little rest and then you will set off to a Native Fishing expedition unto one of the small tributaries of the Amazon River. Learn the local techniques of fishing and for the most daring you can try to fish for Piranhas. During this excursion you can also have the opportunity to look out for the Pink River Dolphin (Inia Geoffrensis). If you are lucky you have your catch cooked for lunch, when you return to the Lodge . After lunch, you will board the boat towards a lake in Yanamono island (best on high tide) where you will be able to glimpse the Giant Water Lily, the Victoria Regia, the “Queen of water lilies”. 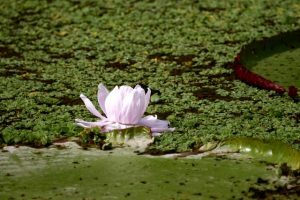 Now renamedVictoria Amazonica, these native flora in the shallow waters of the Amazon River basin are mostly found in oxbow lakes and bayous. You may see some flowers that are white as they bloom on the first night some that have turned pink on the second night after blooming. They can grow to 40 cm in diameter, and are pollinated by scarab beetles.Victoria Amazonica is well known for its huge circular leaves, which are often pictured with a small child sitting at the center of its leaf to display their size and strength. Then consider the Nature Night Hike. Go on an enchanting evening trek within the secure periphery of the Lodge and you will witness the entrancing transformation from daytime to a night atmosphere. As you adjust to the dark environment you will appreciate the rainforest takes on a very different character and be aware of the existence and habits of nocturnal jungle animals. It’s the best time to see stunning tree frogs, shy snakes, and other rainforest creatures that only come out at night. Discern a range of completely distinctive fauna from the day as you listen to magical sounds of insects, birds, jungle cats and night owls. Back to the Lodge for Dinner. Wake up late or rise early — the choice is yours. Breakfast begins at 8:00 a.m., for those who want to avoid the heat, and enjoy nature at its fullest. After breakfast, we will visit a riverside town to see an indigenous tribe of the Yaguas community where you will have the opportunity to learn and see their way of life in the Amazon River. See their homes, school, church, shops and interact with the people, learn their techniques of fishing and farming. Observe their customs and tradition and get enlightened by their unaffected and austere way of living. Return to the Lodge for lunch and check-out. After lunch, depending on your flight schedule, transfer to Iquitos City and according to your departure, transfer to the airport. *Meet our driver in his booth # 5 at the luggage claim area. *Our Programs may vary according to flight arrival / departure changes or weather conditions. *For this program we recommend to take morning flights to Iquitos and your returning flight to Lima in the afternoon. It is important that you bring only necessary clothing and travel gear to the lodge. Due to weight and space limitations on the domestic flight and on the boat to the Lodge, passenger luggage is limited to 10 kg. (22 lbs.) per person. You may store some of your luggage in our office in Iquitos City and take only the most essential during your stay. *Hiking boots or walking tennis shoes resistant to humidity; cotton socks. *Camera with big memory card; preferably in waterproof case. NOTE: When visiting Monkey Island, it is recommended not to put on any insect repellent during the visit. Heliconia Amazon River Lodge, named like that because of the beautiful tropical flower: Heliconia, is one of the most exclusives lodges in the Peruvian Amazon. It is surrounded the rainforest, islands and lagoons full of wildlife. This is a beautiful place to rest and make many activities like bird watching, observation of pink dolphins, jungle hikes, etc. Heliconia Amazon River is located on the banks of the majestic Amazon river (margin left side) in Yanamono’s Communal Reserve, to 80 km away (50 miles away) from Iquitos City. Reserve that deserved the recognition to possess the most quantity of arboreal species in this part of Amazon jungle. This recognition and the characteristics of Yanamono’s Ecosystem commitment us to protect each portion of this jungle with daily sustainable work with the local communities. The Lodge is an eight-building complex, four of them belonging to rooms, the loby / Bar, dining room, kitchen, pool area and other common areas. The roof of the lodge is built entirely using branches of palm leaves called “crisnejas” while the floors in the common areas are wooden, the floor in the bedrooms are tiles *. The buffet service at the lodge is available for no less than 10 guests. Otherwise the food service will be served directly to each table and the meals consist of salads, a main course and deserts combining the regional Peruvian and international cuisine. We also offer bottled water, coffee or tea and refreshments during each meal. The additional requests for refreshments, fruit juice, bottled water and sodas will be charged. We recommend you inform prior to your arrival of any food dietary restrictions, allergies or special diets to program inputs before arriving at the lodge. To families with children we recommend you get in touch with the administrator to make any food arrangements. The electric generator (completely encapsulated) is used for short periods: 2 hours in the morning and approximately 5 hours at night. Use this time to charge your batteries and/or electronic devices. From 10:00 pm. to 6:00am Heliconia lodge is lit by the dim and romantic light of kerosene lamps providing a magical atmosphere to the place. We recommend that you bring a good flashlight to move through the corridors of the Lodge, if you wish. During your stay at the lodge you may still have signal for your Movistar cell phone and occasionally Claro cell phone, but we suggest you turn it off. We do not have public phones or internet.